In the Fall of 1993, EA Sports released the third edition of its NHL video game series for the Super NES, Sega Genesis and PC computer consoles. The game, titled NHL ’94, quickly became popular amongst video gamers and hockey fans. However, at the time few could have predicted the cultural impact that NHL ’94 would have – the game is a touchstone for hockey fans in their mid-20s and 30s and has infiltrated both hockey and popular culture more broadly. The game has been referenced in films, become a defining feature of a star NHL player’s legacy, and now has been stylistically re-imagined in the latest version of EA Sports’ series, NHL 14. In NHL 14, which was released today, gamers can revisit nostalgic features of NHL ’94, including simplified controls, organ music, and blue ice. Video gaming is a significant part of the contemporary sport economy and a major form of online and in-person social interaction for tens thousands of hockey fans. NHL ’94 is undoubtedly the most culturally resonant of the dozens of hockey titles that have been released over the past four decades. This post examines the game’s cultural resonance, contextualizes its development in the broader professional hockey economy, and discusses the ways in which it represents an outlet for and celebration of nostalgia amongst hockey fans. [NHL ‘94] left such a cultural footprint that it was featured in two films in the mid-90s. Notable scenes in “Swingers” and “Mallrats” featured two hockey games, but neither of which were NHL 94 due to licensing issues. Director of “Mallrats” and diehard New Jersey Devils fan Kevin Smith stated that he wanted to have the game featured in “Mallrats” but had to use Sega’s NHL All Star Hockey instead due to sponsorship reasons. The iconic scene in “Swingers” you could tell was the predecessor to NHL 94, NHLPA ’93, due to the lack of logos. NHL ’94 is remembered and celebrated by hockey fans in a variety of other ways. Since 2005, the website NHL94 Online has used emulators to allow online tournaments between users around the world. And a number of blogs and websites keep tabs on which players from NHL ’94 are still actively playing. In 2008, the blog Barry Melrose Rocks counted 43 NHL ’94 “survivors” active in the NHL or European leagues, including players such as Chris Chelios, Ed Belfour, Mike Modano, Sergei Fedorov, Joe Sakic, and, yes, Roenick. By 2013, gaming website Kotaku reported just three remaining active players from NHL ’94: Martin Brodeur, Roman Hamrlik, and Jaromir Jagr. That a player’s inclusion in NHL ’94 is a notable marker speaks to the significance of the game in the collective memory of many hockey fans. 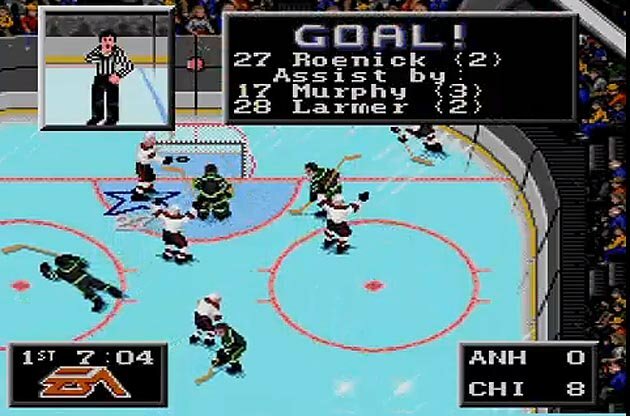 Clearly, for a relatively simple video game (at least by today’s standards), NHL ’94 has had a startling cultural resonance in and beyond hockey culture. Its current immortalization in NHL 14 confirms its lingering significance and the nostalgic attachment that it holds for fans. NHL ’94 was released at a significant moment in NHL history. Gary Bettman became league commissioner in February, 1993 and oversaw the league’s ambitious expansion plans. Prior to Bettman’s tenure, the league had moved from 21 teams to 23 with the addition of the Ottawa Senators and Tampa Bay Lightning in the 1991-92 season and had announced the further addition of the Mighty Ducks of Anaheim and Florida Panthers for the 1992-93 season. Under Bettman’s leadership, the NHL would expand to 30 teams and relocate the Quebec Nordiques, Winnipeg Jets, and Hartford Whalers. The NHL’s “Sunbelt strategy” ultimately resulted in the following new teams in “non-traditional,” warm-weather hockey markets: Mighty Ducks of Anaheim, Atlanta Thrashers, Carolina Hurricanes, Dallas Stars, Florida Panthers, Nashville Predators, Phoenix Coyotes, and Tampa Bay Lightning. Other new teams included the Columbus Blue Jackets, Colorado Avalanche, and Minnesota Wild. The aggressive expansion to US markets marked a significant shift in the NHL’s business operations and symbolically represented the league’s quest for growth and profitability in the North American sport marketplace. Notably, this was a time of increased marketing and cross-promotion for professional sport leagues. Trading cards became big business, an increasing array of merchandise (clothing, posters, giftware, etc.) became widely available consumer goods, and TV shows and movies were cross-marketed with sport leagues and personalities. Video games fit perfectly in this consumer frenzy surrounding professional sport, particularly given the rising popularity of PC games and consoles from Nintendo and Sega Genesis. Thus, the widespread popularity of EA Sports’ NHL series was both a product of and contributor to the growth of the NHL as a consumer product in North America. If the mid-1990s economy of professional sport helps explain some of the circumstances that made NHL ’94 popular at the time of its release, it also helps explain some of the game’s lingering nostalgic popularity. Many fans have been far from supportive of the changes to the NHL since the expansion of the 1990s, and have vilified Bettman for his role in the league’s business practices. NHL ’94 (which included the new franchises in Tampa Bay, Ottawa, Florida, and Anaheim) freezes in time an NHL on the cusp of major changes, at a time when the impact of the league’s Sunbelt strategy was not yet clear. The fact that the game features beloved former teams such as the Nordiques, Whalers, Jets (1.0), and North Stars adds to its nostalgic significance. There is a huge contemporary nostalgia for defunct sport teams, including the Nordiques, the Whalers, and the MLB’s Montreal Expos – memories of NHL ’94 offer a window into a seemingly long-gone era in NHL history. Of course nostalgia often clouds historical detail. The NHL has always been a profit-chasing enterprise, and its owners and commissioners have shown no hesitation to place their own financial interests above those of fans and players. There was never a “pure” NHL unsullied by financial interests, and the expansion and relocations of the 1990s were a near-inevitable outcome of the political economy of professional sport in the late twentieth century. Video gaming has its own political economy in which sport series feature. But the affinity that many hockey fans still feel for NHL ’94 suggests that there is social significance to the game and to the fandom of many hockey fans. As such, the game is a fascinating cultural artifact for those interested in hockey culture and fandom.